The one thing you have to admire about a communist like Bernie Sanders is he doesn’t try to hide his political views at all. He’s writing a book for American teenagers who aspire to be progressive Marxists entitled: “Bernie Sanders Guide to Political Revolution.” The release date is August 29th. Gee, that’s sounds like an incitement to violence and revolt to me. It’s a training manual to groom young political activists. Sanders is stoked that he overwhelmingly won the young vote in the last presidential election. Hitler famously said: “He alone, who owns the youth, gains the future.” And that is where communists are focusing their efforts… with young Americans, so they can brainwash them into following their ideology and implementing it. You see it in our universities, high schools and grade schools that promote sheer communist propaganda to students with no repercussions whatsoever. They have turned our schools into communist breeding and training grounds. Both of the major political parties have overlooked this demographic and it is a huge mistake… they are indeed the future of American politics. The Republicans have focused on the forgotten men and women; the working class in America. And they should… but they also forgot the youth who are struggling and who are beyond frustrated. The Democrats are all wrapped up in racial and gender politics and they missed it altogether under Hillary Clinton. But not Sanders. He was savvier than that, as most died-in-the-wool communists are. The book, designed as a how-to guide for students eager to begin work as political activists, is out on August 29th, The Guardian reported. In a forward to the book, Sanders notes that he overwhelmingly won younger voters among all demographics during his 2016 bid for president. Sanders also told Teen Vogue that the book will explain to a younger audience how to get involved with America’s democratic system. According to Teen Vogue, the book also includes dozens of infographics about issues like income equality and money in politics that Sanders made famous during his 2016 presidential bid. Republicans would do well to start reaching out to young Americans before a radical like Bolshevik Bernie turns them entirely against free market capitalism and the freedoms our Constitution empowered us with. He’s doing his damndest to pull the Democratic Party even further to the left and embrace full-fledged communism. Many already have – you see them everywhere anymore and they aren’t shy or afraid these days. Many of them have taken positions in government and are very powerful now. They are just waiting for the tipping point to seize full control. A generation of young readers raised on the struggle for justice imagined in The Hunger Games and Divergent can welcome a new superstar YA author aiming to inspire a revolution in the US’s contemporary dystopia: Senator Bernie Sanders. What dystopia? Things are improving in the US under President Trump. I certainly don’t agree with everything Trump does or says, especially when it comes to Russia… but he is a vast improvement over Barack Obama. In fact, Sanders learned from Obama, because younger Americans were what got him elected. In the forward of Sanders’ book, he praises the current generation of young Americans as the most tolerant and intelligent in history. With faint praise and slippery rhetoric, Sanders is turning a whole generation into Marxist acolytes… just waiting for the next revolution. 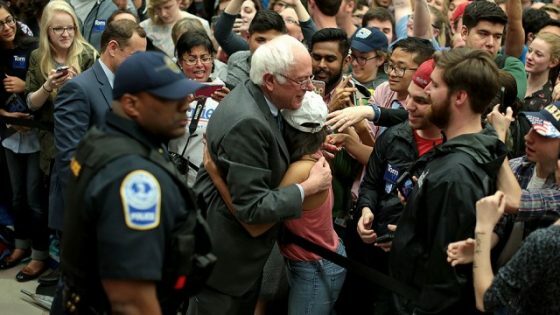 “The current generation of young people is the smartest, most idealistic, and least prejudiced generation in the modern history of the United States,” Sanders writes. “This is a generation that is prepared to think big and move this country in a very different direction than we have been traveling for years.” I am sure he means that and the direction is no doubt revolution and communism.